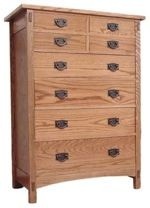 Make this eight drawer companion chest for a Mission style bedroom group our other plans can help you to build. Four graduated drawers below and four small drawers at the top of this chest provide ample storage space in an attractive and historically accurate manner. Through-tenon construction is used, as you can see in the photo. Authentic. This is a blueprint style plan which is heralded by beginners and experts alike as being a pleasure to work from because all parts are printed in full size -- all joinery is shown in actual size, curved workpieces are all in full size, allowing you to measure and trace straight from the drawing if necessary. A Bill of Materials doubles as a cutting list, a detailed exploded diagram and all hardware requirements are listed. Because this is an older plan, a *shopping list* and *cutting diagram* are not provided. The exploded diagram is sufficiently detailed that project specific assembly instructions are not provided.